Having just attended the Lamaze conference in Orlando, Florida, it is alarmingly clear that women have to become proactive in reclaiming our rights to give birth the way we want. We spoke with several Lamaze instructors who shared their own personal experiences in hospitals and the obstacles they are up against in providing all the evidence-based information in their childbirth classes. Many if not most hospitals are NOT practicing evidenced-based care when it comes to delivery and postnatal care of mother and child. The most important thing we learned that can be very helpful in creating change is this; hospitals are sensitive to a certain rating based on the number of complaints (or not) received by patients. The problem is that women aren’t complaining because they really don’t know what their choices should be in regard to having their best birth. 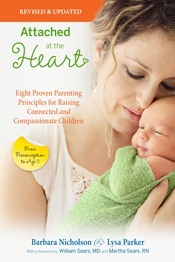 So all of us have to play our part in educating women, our friends and family members, about healthy birth practices and also encouraging women to write letters of complaint to their hospitals if they aren’t satisfied and request changes be made to improve outcomes that are in line with the healthy birth practices outlined in our book Attached at the Heart and at www.lamaze.org. We will make those links available soon. Thank you for asking and stay tuned!